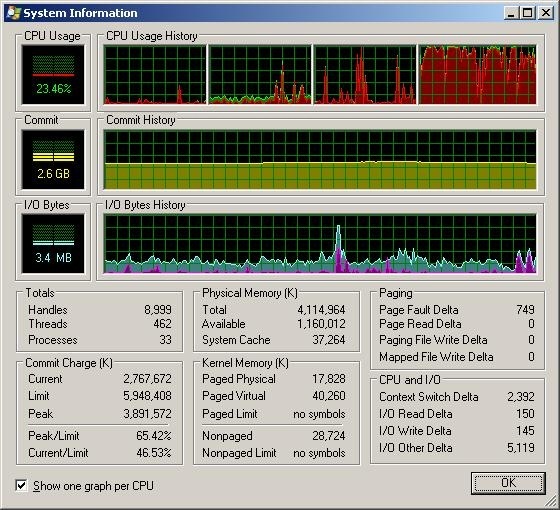 The Process Explorer picture says it all on the quad core I was testing the other day. I was running three virtual images concurrently and as you can tell one core bore nearly all of the weight. I’ve heard that Virtual Server can actually make use of multi-core systems. I’ll do some more testing with Virtual Server in the next couple of weeks. So twitter is part interesting, complete waste of time and useful. Watching the threads of conversation stream through Witty or the web interface can give you some great insights but can be exhausting if you try to constantly follow every thread. One minute you might hear about how frequent a .Net developer’s wife’s contractions are, the next Scott Bellware may elucidate his followers with some wise-sounding statement and in the background there is general chatter about how the Seattle Code Camp is going. The key is to follow the right people and generally just watch the conversations. When you have the time you can put in your 2 cents or update people with what you’re up to. 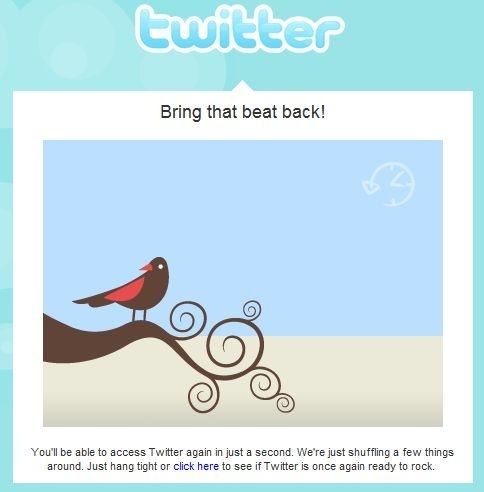 Whether you love it, tolerate it or just hate it; likely the most common thing you will see is the twitter bird. I hope they can bring the beat back more often considering how often the service goes down (but hey, it’s free so they can get away with that right?). I’ve been wondering what exactly they are “shuffling” around. So now I ask you, how much more inane can blogging get considering I’m blogging about twittering? We are planning our first ever Iowa Code Camp. It’s going to happen at the University of Iowa’s Conference Center in Iowa City on Saturday May 3rd. The details are coming together nicely and we already have about 1/2 of our speakers in place. We are currently looking for more sponsors to provide some good food, drinks and prizes. If you are interested in helping in any way, leave me a comment and I’ll make sure to pass your information on to the right person. Most of the time Firefox 2 has been a great browser (I use FF2, IE7 and Opera9 for the record). The issue I kept having was that if I didn’t completely close out of an instance of Firefox every day or so its memory usage went through the roof. Now Process Explorer shows the private bytes up to 200+ megs when I have a lot of tabs open, but when I close down old tabs, the memory usage comes back down proportional to how much I’m doing with Firefox. This is what you would expect. Before it would creap up to 250 megs and would just keep climbing even if I went back down to a single tab. The only changes on my system that have happened between a couple of months ago and now are these: 1)Firefox was reved to 2.0.0.11 2) I installed Firefox 3 Beta 1 for a time and then uninstalled it and Firefox 2 and then reinstalled Firefox 2. I’m guessing that Firefox 2.0.0.11 finally fixed some memory issues. So I’m currently ranked #6 in Google if you search by my name. I have plenty of friends who own their own .com domain names using their real names; luckily their names are rather unique on the web. I happen to share my name with a well known English soccer/football player. He’s about 2 inches taller than me, is quite wealthy and happens to play soccer like I do in my dreams on rare occasions. All this to say I have some serious competition. My goal is to unseat him from his #1 position in Googleland (you do need to know that he retired in July of 2007 which should help). This may be like Coldplay saying they want to unseat U2, but we’ll see where things are come December. Btw, on Live.com I’m on the 3rd page. Yahoo has me very low on the first page. 2008 is here and it’s freezing (about 4° F, without wind chill) cold. I pulled out my snowshoes today and hiked for about 40 minutes into a strong headwind. It was a good hike, but I had to duck into a culvert a couple of times to keep my face from freezing. I hope to be outside much more this year (biking, canoeing, hiking, fishing and snowshoeing). On the tech front I’m going to blog more consistently. Iowa doesn’t currently have many prolific tech bloggers, so I think its time we banded together. Here are a few of the Iowan techies I know: Tim Barcz, Javier Lozano, Arian Kulp, Nick Parker, Tim Gifford and Bryan Sampica. We are planning the first ever Iowa Code Camp possibly on Saturday March 1st. There will be more to come on this. If you are interested at all in helping out, please contact me and I’ll get you plugged in. The website is certainly not ready, but I’ll be working on it as I have time. CRIneta.org held even in attendance and stabilized a bit this year. I’ll likely be president again this year; I’d like to keep the stability and grow the group in 2008. We’ll bring in two Ineta speakers and might get to bring a third national speaker if things work out with one of our sponsors. We’ve also had an excellent experience with our local speakers and want to keep them presenting (Javier, Arian, Nick, Mike Jackson, Eric Johnson and Bryan).